There’s really two questions here. The first concerns the size of the US military budget and how much extra that budget might have had to have been to cover the ‘Middle Eastern Wars’. The second is on how that budget impacts on the National Debt. The United States spends $50 billion annually on the war in Afghanistan, Kentucky Sen. Rand Paul has repeatedly claimed, and the numbers back him up. The U.S. will spend $46 million in the country in 2018, the Pentagon estimates. Annual reports show the U.S. has spent at least $40 billion annually since 2008, peaking at $118 billion in 2011. Department of Defense officials announced the $46 billion estimate in a March Senate hearing. 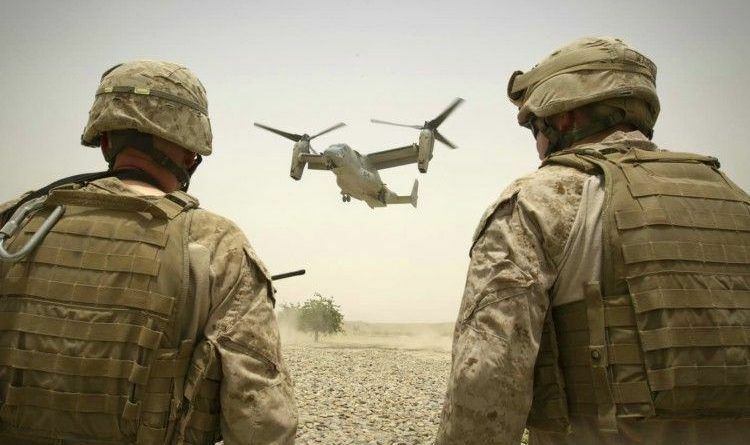 This figure includes about $13 billion for U.S. forces in Afghanistan, $5 billion for Afghan security forces and $780 million in other assistance for the country, officials also noted during the hearing. The officials did not provide additional detail, but they implied much of the remaining $27 billion will fund logistical and support operations for U.S. and allied forces in landlocked Afghanistan. Many US army participants would have needed to be paid anyway. If they weren’t engaged in the real thing then they’d probably have been on exercise. But if you research the figures, starting with the Military budget of the United States you can form some estimate for the extra cost that recent military actions have incurred. The real costs are the loss of lives on all sides of the conflict. I always have a problem whenever anyone tries to put a dollar and cent valuation on those lives lost and badly impaired. If the US Federal Government spends an amount of money on anything, the military, a moonshot, grants to the States or whatever we need to look at where that money goes. The pay of a US soldier is subject to Federal taxes so some 25-30% or so would go straight back to Uncle Sam. Then the remainder of his pay is spent and respent in the economy. The Federal Government takes its cut on nearly all legal transactions so eventually the Government does get it back UNLESS it is saved in a bank account or spent buying something from a net exporting country like Germany. The Fed can’t impose taxes on Germany so the money initially spent then does add to the Govt’s deficit. So there you go there is the answer to the first two questions but the most difficult part is that we spend a lot in the wars on the middle east! U.S. spending on Afghanistan, however, has more than halved compared to the $100 billion and more annually spent from 2010 to 2012. Troop levels have also declined from a peak of 98,000 in FY 2011 to around 14,000 today, although President Donald Trump’s administration is increasing U.S. presence in Afghanistan with troop surges and a stepped up bombing campaign amid the Taliban’s resurgence. The Pentagon’s key priority remains supporting and training the Afghan National Defense and Security Forces (ANDSF) so the country can maintain its own stability and peace, the U.S. Department of Defense has stressed. Do you think we should withdraw our forces from the middle east or should we continue spending on the wars that rage there?